Josh Groban, Sam Concepcion, Jed Madela, and other celebrities use Twitter to congratulate Charice for her 'Glee' debut. The first episode of the second season of Glee was anticipated by legions of fans all over the world, especially by Filipinos because of a new character portrayed by Pinay international singer Charice. After becoming a certified international recording star with her debut single "Pyramid" topping the singles chart in various countries, Charice tries out acting on the popular TV series. 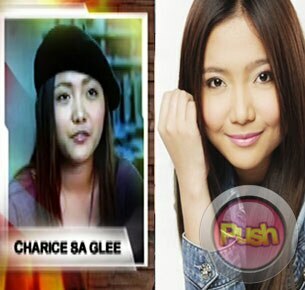 Even celebrities who are successful in their own right couldn'rsquo;t help but adore Charice for her latest success. Through the online social networking site Twitter, numerous celebrities post their congratulations for the Pinay singer. Josh Groban, who appeared on Glee as himself in the show'rsquo;s previous season, posted on his Twitter account, "Charice. Great job on Glee! Very happy that so many people will hear your beautiful voice." Charice'rsquo;s fellow Little Big Star finalist Rhap Salazar re-tweeted Josh'rsquo;s post as a way to congratulate Charice. Fellow Little Big Star alum Sam Concepcion posted, "Way to go Charice! You make us all proud! Keep 'lsquo;em coming!! Pinoy pride baby!" Another singing champion Jed Madela also tweeted his congratulations. Former MYX VJ and singer Nel Gomez was overwhelmed by how Charice is giving honor to the Philippines once again. "Congrats Charice. God really blessed you. We are all proud of you! Feels good to be Pinoy! If one person can do it, then we all can! God bless you guys." Pinoy Big Brother ex-housemate Say Alonzo wrote, "You are living our dream Charice!" while Maxene Magalona posted, "Kapuso man o Kapamilya, masarap maging PINOY! One love!" In the season premiere episode of the pop musical program, Charice sang two songs. The first was Lady Gaga and Beyonce'rsquo;s "Telephone," a showdown with Glee'rsquo;s lead star Lea Michelle. The other one was "Listen" from the movie Dreamgirls, a rendition which actress Pauleen Luna talked about on her Twitter. "I just saw the scene of Charice in Glee where she sang Listen. Oh my gosh. GOOSEBUMPS EVERYWHERE! I'm so proud of her!" After the episode aired in the US, Tim Stack wrote in his article published on EntertainmentWeekly.com, "Charice/Sunshine's (Charice'rsquo;s character in Glee) voice is insane, especially considering she's about the size of a lawn gnome and dresses like a Harajuku girl (although I do always love the addition of a nice beret)." Charice'rsquo;s character name Sunshine Corazon became the day'rsquo;s second trending topic worldwide on Twitter.